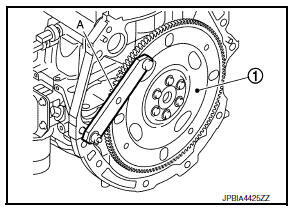 Remove the engine and the transaxle assembly from the vehicle, and separate the transaxle from the engine. Refer to EM-86, "CVT : Exploded View". Secure drive plate (1) using Tool (A), and remove bolts using suitable tool. Remove pilot converter (1), from the rear end of the crankshaft. Use Tool (A), if necessary. Install pilot converter (1), drive plate (2) and reinforcement plate (3) as shown. Using a drift of 33 mm (1.30 in) in diameter, press-fit pilot converter into the end of crankshaft until it stops. 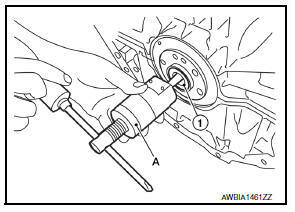 Secure drive plate (1) using Tool (A), and install bolts using suitable tool. Be careful not to damage or scratch contact surface. 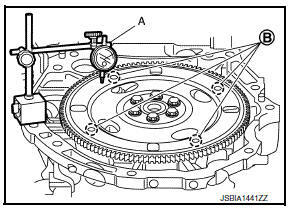 Measure the deflection of drive plate contact surface to torque converter with a dial indicator (A). Measure the deflection at the area limited between 12.4 mm (0.488 in) dia and 20.0 mm (0.787 in) dia around hole (B). Limit : 0.35 mm (0.0138 in) or less. If measured value is out of the standard, replace drive plate.